It’s always a wonderful thing when you get a chance to catch up with an old friend. You get to hear all about what they are up to in the world, as well as fill him or her in on what has been going on in your world. It’s particularly wonderful when the world of your friends and the world in your head begin to sync up and you begin to see common patterns that maybe keeping both you and your friend from being, doing or having your best and reaching your full potential. I’m sure you know what that’s like! It was quite easy to assume that Chris’s contact with his “shoulds” never happened, because I would never hear about them again. As I began to explore, and get more curious about what drove this behavior, I saw that I and many of my friends and clients suffer from the same limiting pattern. It seems like in some form or fashion, we were all doing the same thing: procrastinating with interactions that could propels our progress. I remembered all of the times in my younger years when I had put off connecting with someone because I was waiting for a “better time”. With regard to my friend, I realized that this conversation was a perfect opportunity to for us to create a strategy that would move us from “saying we should contact someone we would like to build a relationship with” to actually doing it. Then my friend uttered those words again: “I really should reach out to him”. This time I asked him: What’s a way to make sure that you move towards making it actually happen ? He asked for my strategic advice and I gave it to him: Why don’t you create a short note on your phone? On a piece of paper that will support you in sending that person some sort of communication down the line? Even if it’s only a three sentence invitation to get you started,the communication has begun. I felt like I could hear Chris smile over the phone. That’s great. I believe that will work. I told him if he grabbed his phone or a piece of paper and wrote the note there, he was one step closer to actually making the conversation with that person happen. In the end, I am committed to establishing a new strategy for how I deal with the “ shoulds” in my life and in the lives of my friends, family and clients. 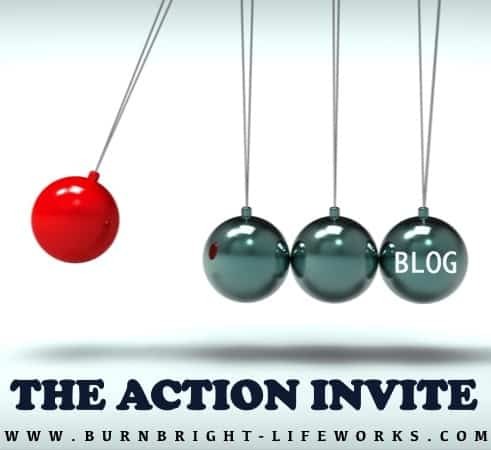 Whenever I hear myself or someone else limit connecting with another person due to a “should” or any of the other slew of limiting language or beliefs, I am going to invite them to give the BurnBright Action Invite Strategy a try. I really believe this strategy can move you one step closer to making valuable connections happen in your life and with your work – FOR REAL. Can you relate? Are you holding off making a connection because you are saving it for the perfect moment when all of your ducks are in a row? As if that will ever come! The truth is that those perfect moments when you are perfectly prepared rarely exist. What are your thoughts on the “really shoulds” that keep you from following through? I want to know! What are some strategies you have for bursting through?